Saturday morning July 30, 2011, all the CalROCS competitors are excited to finally take on the course at Donner Ski Ranch. Donner is always the favorite spot for competitors and spectators, so of course it is the perfect location for Round 4 of the CalROCS extreme rock crawling series. As the competitors walk the new courses that CalROCS has laid out, they share stories of past events, achievements, and carnage. They cannot wait to hit the rock so they can get new stories to share around the campfire, new achievements, and new broken parts to fix, just so they can do it all over again. Round 4 was an event to remember for all who attended. There were only a few rigs that made it through all 8 courses without breaking something or ending up on their lid. CalROCS always sets up courses to put on a show for the crowd and at Donner they decided to please the crowd with huge drop offs. Many of the drivers went down the drops backwards to use the weight of the motor to keep them on all fours, but this strategy did not work for all drivers. For others, it worked too well, causing links, heim joints, and steering rods to break on impact. Even though the courses were taking their toll on many of the rigs, they did not stop the drivers from having a great time. The competitions were very close and just a few points decided the winners. Competitors fought for every point, one back-up could be the difference between 1st and 2nd. Drivers were watching each other carefully making sure that every back-up and progression were counted. Even as rule book pages were flying, all the competitors kept great attitudes and helped each other out when needed, showing just how great the sportsmanship is at these events. During the event drivers may be competing against each other but at the end of the day, all the rivalries drop away. CalROCS Round 4 was a every close competition. Dennis Stansfield may have dominated the Donner courses, even beating the best scores in the class above him, but the competition for 2nd and 3rd came down to 2 points. Wade Coffee and Ashley Hall were battling all weekend for the 2nd place trophy, but in the end Wade Coffee took home the silver. Jim Brown is a very consistent driver, always putting up low scores, and he took 1st in the Full Body class. Pro Mods class 1st place trophy went to Dan Patterson by 1 point with –34 against Chris Brown with –33. The Super Mod class has been taken over by the Canadian, Rob Kaufman, who has taken 1st place in every event he has competed in. Justin Hall also took 1st again for the Unlimited class. If you missed out on the great show in Donner, you have one more chance to watch these amazing drivers take on CalROCS. 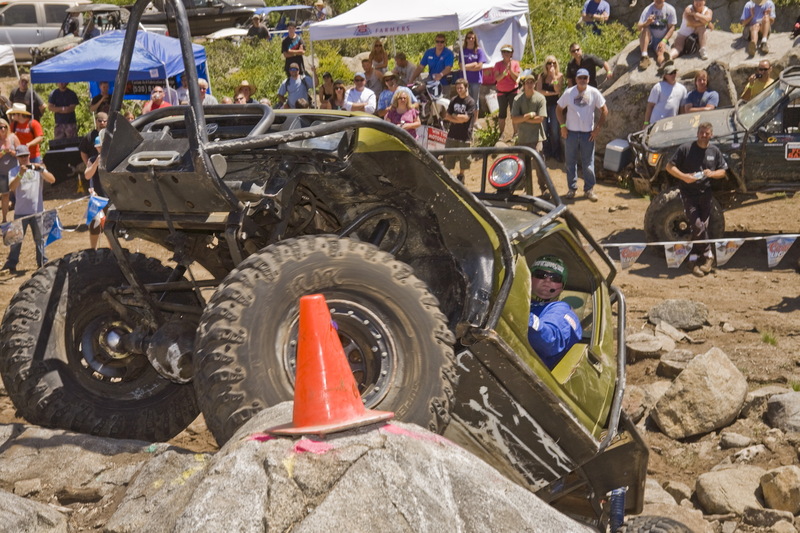 They will be coming to Surplus City in Oroville, CA, for the final round of the CalROCS extreme rock crawling series on August 13th and 14th. Drivers are going to be putting it all on the line to grab the win for the year – so make sure you are there to see all the action!